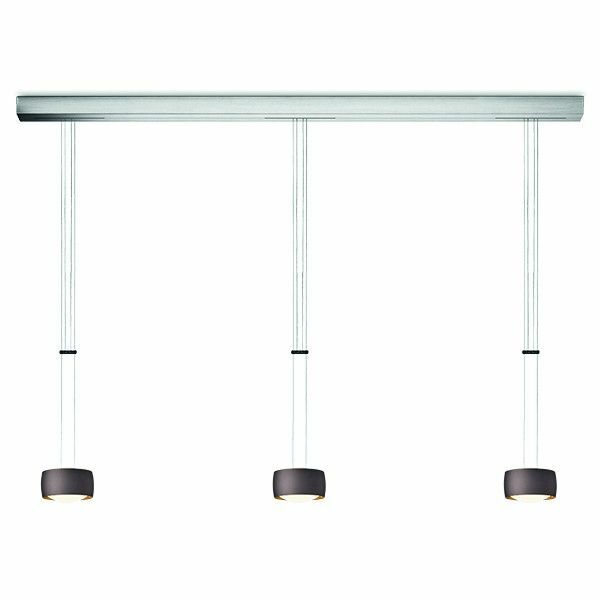 Product information "Grace Triple LED Suspension Lamp"
The Triple Suspension Lamp from the Grace series by Oligo also looks like a trio of light balls surrounded by a metal band. The lens-shaped shells on the top and bottom are satined, so that glare-free illumination is made possible. The timeless and elegant design is typical for the German manufacturer: he designs "less is more" by the motto and offers enchanting luminaires with a reduced shape language, which nevertheless convince with great grace. Oligo equips these luminaires with high-quality LED technology: in the sense of sustainability, they are extremely energy-efficient and have a long service life. The pendulums are individually height-adjustable and dimmable with gesture control. Canopy Dimensions in inch (WxHxD): 55.11" x 17.71" x 29.52"
Dimensions in inch (WxHxD): Ø 5.11" x 3.14"
Max. Total Height in inch: 62.99" - 78.74"
Related links to "Grace Triple LED Suspension Lamp"